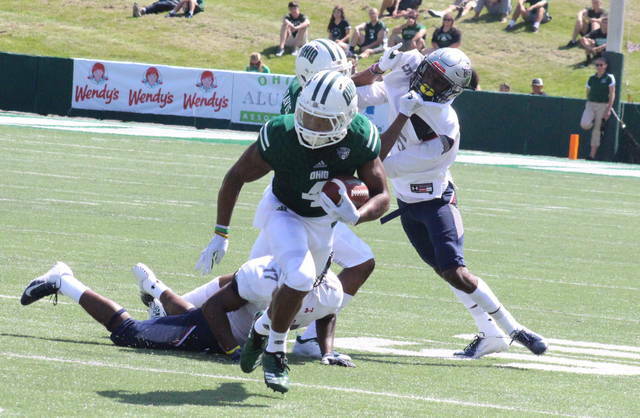 Ohio senior Papi White (4) races down the sideline, during the Bobcats’ win over Howard on Sept. 1 in Athens, Ohio. Ohio senior Jalen Fox records a tackle for a loss, during the Bobcats’ win over Howard on Sept. 1 in Athens, Ohio. KALAMAZOO, Mich. — The Bobcats have started a trend of winning a lot-to-14. For the third straight game the Ohio football team allowed 14 points, while scoring at least seven touchdowns, as the Bobcats rolled to a 59-14 victory over Mid-American Conference host Western Michigan on Thursday at Waldo Stadium. The Broncos (6-4, 4-2 MAC) — who hadn’t lost at home to the Bobcats (6-3, 4-1) since 1998 — missed a field goal on the game’s opening drive and gave the Green and White the ball 78 yards from paydirt. Ohio needed nine plays and 4:52 to cover the distance, with Nathan Rourke scoring on a six-yard run to cap off the possession. Louie Zervos made his first of eight straight extra-point kicks, giving the Bobcats a 7-0 lead with 7:18 to go in the first. On the ensuing WMU drive, Bobcat sophomore Austin Conrad recovered a fumble to restore possession for the guests 19 yards from the end zone. Three plays later, Ohio went up 14-0, as Rourke found Papi White for an eight-yard scoring pass. Western Michigan was forced to punt for the first time on its next offensive try, and the Bobcats blocked the punt. Ohio freshman Alvin Floyd recovered the ball and returned it 13 yards for a touchdown, giving the guests a 21-0 advantage. 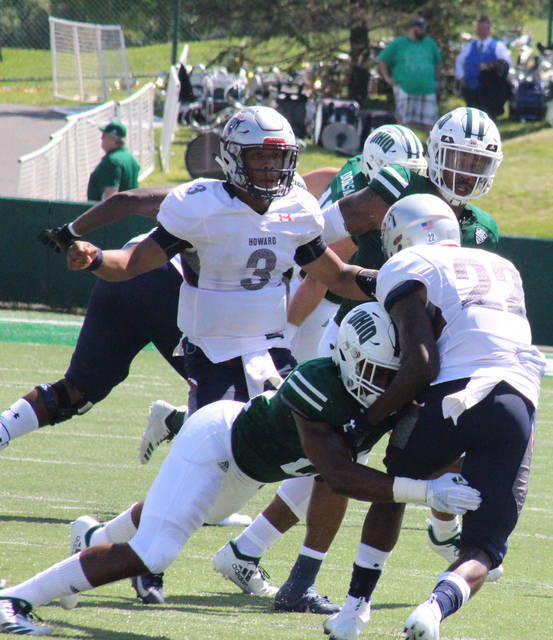 Ohio missed a field goal on its first possession of the second quarter, but sophomore Jarren Hampton intercepted a pass to give the ball back to the Bobcats at their own 36. Ohio needed just three plays and 1:09 to over the 64 yards, as Rourke rushed in from 13 yards out to increase the OU lead to 28-0 with 7:16 left in the half. There was a fumble on the ensuing kickoff and Tariq Drake came up with the ball for Ohio. The Bobcats were forced to settle for a 30-yard field goal by Zervos, extending the lead to 31-0 with 4:42 left in the half. WMU fumbled the ball away on the following kickoff as well, with Alex Wolff recovering for the Green and White. Two plays later Rourke found Adam Luehrman for an eight-yard scoring pass, giving Ohio a 38-0 advantage with 4:01 remaining in the half. The Broncos turned the ball over on downs after just four plays on their next drive, and Ohio took over with 44 yards to paydirt. The Bobcats needed five plays to make their halftime lead 45-0, with Rourke delivering a 10-yard scoring pass to Isiah Cox. Ohio went three-and-out on its first possession out of the break, and Western Michigan responded with its first scoring drive. On the 11th play of the 65-yard drive, Jamauri Bogan plunged into the end zone from one-yard out. Gavin Peddie made his first of two point-after kicks, cutting Ohio’s lead to 45-7. Ohio suffered another three-and-out, but Kylan Nelson intercepted a pass near midfield for the Green and White. Two plays later, A.J. Ouellette scored on a 17-yard run, making Ohio’s lead 52-7 with 5:14 left in the third. After a punt by each side, Western Michigan trimmed its deficit to 52-14 with 10:36 left in the game, as freshman quarterback Kaleb Eleby found Jaylen Hall for a 26-yard scoring pass. Ohio put a cherry on top of its 59-14 win with 6:49 left, when Quinton Maxwell broke an 18-yard touchdown run. The victory makes Ohio bowl eligible for a 10th consecutive season. In the triumph, OU claimed a 24-to-13 advantage in first downs, with a 5-to-3 edge in third down conversions. Ohio enjoyed a 420-to-270 edge in total offense, and won the turnover battle by a 6-0 tally. Rourke was 12-of-14 passing for 149 yards and three touchdowns, while earning 68 yards and two touchdowns on nine rush attempts. Maxwell had two carries for 18 yards and a score, while completing 1-of-5 passes for 15 yards. Ouellette led the Ohio ground attack with 71 yards and a touchdown on eight carries. Maleek Irons had 49 yards on eight tries, David Burroughs added 35 yards on five carries, while O’Shaan Allison earned 24 yards on seven totes. Andrew Meyer led the Bobcat receiving unit with 65 yards on four receptions. White and Cox both had 39 yards and a touchdown, with four and three catches respectively. Cameron Odom caught one 13-yard pass, while Luehrman had one eight-yard scoring grab. Tyler Gullett had a team-best five tackles for the Bobcats, while Marlin Brooks and Kent Berger had a sack apiece. For WMU, Eleby was 10-of-19 passing for 152 yards with one touchdown and two interceptions. Chase Brown led the team with 52 yards on 15 carries, while D’Wayne Eskridge had a team-best three receptions for 50 yards. Justin Tranquill led the Bronco defense with nine tackles, while Najee Clayton and Kailien Guillory each had a tackle for a loss. The Bobcats return to the field on Wednesday, as 3-6 Miami hosts Ohio for the Battle of the Bricks on ESPNU at 7 p.m.